Using a precision formation-flying technique, the twin Grail spacecraft will map the moon's gravity field, as depicted in this artist's rendering. 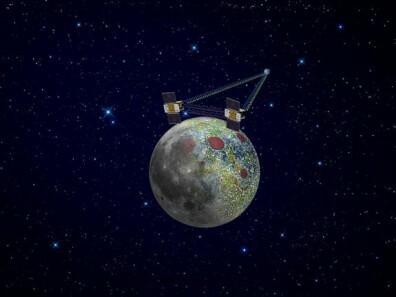 Radio signals traveling between the two spacecraft provide scientists the exact measurements required as well as flow of information not interrupted when the spacecraft are at the lunar farside, not seen from Earth. The result should be the most accurate gravity map of the moon ever made.